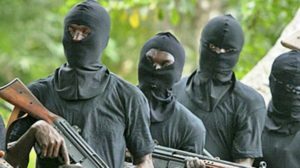 Bandits have killed a priest of the Church of Nigeria (Anglican Communion), Anthony Jata’u in Gusau, Zamfara State, on the way to his new station in Katsina State where he was posted by the Sokoto Diocese of the church. Sources close to the family told Punch News on Tuesday that Jata’u, from Southern Kaduna, was abducted last Thursday alongside his wife, three kids and two sisters-in-law. Another source in the Anglican Church, Sokoto Diocese, who spoke on condition of anonymity, added that the kidnappers had called the church and some family members to demand N10m ransom before releasing the deceased’s wife, kids and in-laws. Spokesperson for the police in Zamfara State, Mohammed Shehu, said he would find out about the case and give details of the incident. This entry was posted in abduction, Christianity, Crime, News and tagged Anglican Priest, Kidnappers. Bookmark the permalink.